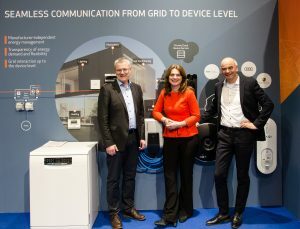 OCA and EEBUS connect Electric Cars to Smart Homes - EEBus Initiative e.V. The Open Charge Alliance (OCA) is joining forces with EEBUS to teach electric cars, charging stations and home energy systems the same language. At the E-World Energy & Water conference in Essen on February 7th, the two parties signed a liaison agreement to harmonize the interfaces between their protocols, which will create several new applications for smart homes, smart grids and E-mobility. The EEBUS Initiative e.V. is a non-profit association of more than 70 manufacturers working on networked building technology, E-mobility and energy. EEBUS is the leading standard for energy management inside homes and buildings. The EEBUS-communication standard connects all kinds of flexible energy consumers and producers among each other and with the grid. OCA is the developer of the Open Charge Point Protocol (OCPP), the leading open standard for the charging infrastructure, enabling electric vehicle (EV) drivers from all over the world to charge anywhere at their own terms. Just like the use of OCPP, EEBUS is license free and can be implemented by anyone. EEBUS has the ambition to share their protocol and to promote open standards. OCA and EEBUS agree to exchange use cases, describe and harmonize the interactions between both standards. Together, the two organisations will set up a demonstrator to proof seamless communication among the protocols. At the E-World Energy & Water 2019 in Essen, Josef Baumeister, CEO of EEBUS, Lonneke Driessen, director of the Open Charge Alliance (OCA) and Peter Kellendonk, 1. Chairman of the EEBUS Initiative (left to right) have signed a liaison agreement to harmonize the interfaces between the protocols of the two organizations. Our mission is to foster global development, adoption, and compliance of communication protocols in the EV charging infrastructure and related standards through collaboration, education, testing, and certification. · Our strength is a fundamental commitment to open processes and products. · Free to use: no constraints on the use of the standard. · Development is open and market driven to meet existing and emerging technical and business requirements. · Pragmatic approach that leverages knowledge and experience of experts in EV charging infrastructure. With more than 120 participants we span all sectors of the industry, including charging equipment manufacturers, software and systems providers, charging network operators, and research organizations. The EEBUS Initiative is a non-profit organization with over 70 members who are the leading stakeholders in all fields of connected home, electrical mobility, energy and smart appliances. Members of the EEBUS Initiative collaborate in various working groups to establish a standardized and common language for the interoperability of connected devices. Smart heating, electrical vehicles, photovoltaic systems, smart home systems, energy managers and other appliances can thus communicate seamlessly about energy management and usability.